Concrete Floor Cost - What is the cost of a concrete floor? I'll share with you the concrete floor cost I charge my customers, what's included, and what's not included. My name is Mike Day, I own Day's Concrete Floors, Inc in North Monmouth, Maine. I've owned my concrete business for 26 years, so I have some experience when it comes to concrete floor prices. We also do a lot of other decorative concrete applications, you'll be able to find pricing for stamped concrete, stained concrete, and more at the bottom of the page. MY BASIC COST TO POUR AND FINISH A CONCRETE FLOOR IS $3.00 - $3.50 PER SQUARE FOOT. This is for a plain grey concrete floor, poured inside a concrete foundation that I can closely back the concrete truck up to. 10. Styrofoam - used a lot for radiant heat floors Those are the basics of what's included and not included in my concrete floor costs. For residential concrete floors my $3.00 - $3.50 dollars per sq. ft. cost will remain consistent throughout the year. 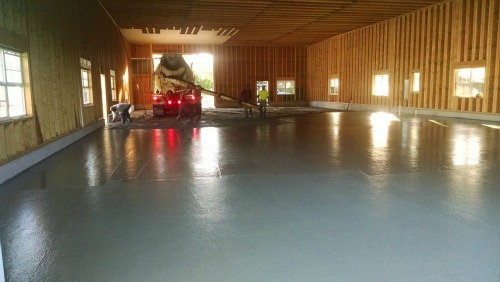 For commercial concrete floors the cost is anywhere from $.50 - $1.00 dollar per sq. ft. more. If you're trying to figure what the cost for concrete flooring is in your area, I would suggest calling a local redi-mix concrete company and asking them for 3 referrals. They know who does quality work and who doesn't. Stop by a construction site and talk to the general contractor, they usually get estimates for their concrete floors from more than one concrete contractor. Most importantly, don't always settle for the lowest bid. A concrete contractors reputation for excellent quality work does figure into the cost of a concrete floor, I know mine does.